Most of Microsoft Windows operating systems give an opportunity for user to change domain password from hisher computer but only in case both the computer and user account belong to this domain. If the computer cant join a domain (in particular if there is Home Windows edition installed) if there are multiple domains or in peer-to-peer network the user is forced to ask network administrator to change network passwords. SynchroPass can solve this problem. 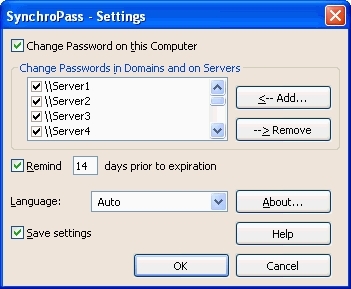 It allows to synchronously change passwords for current user account on local computer in one or several domains and on one or multiple peer-to-peer servers. The program also can inform user about passwords expiration and invalidity. SynchroPass can be used on systems with Microsoft Windows NT 4.0 2000 2003 2008 2008 R2 2012 XP Vista 7 or 8 operating system installed. Both 32- and 64-bit OS versions supported (but the program itself is 32-bit). SynchroPass can not be used on Windows 9X computers. Also it cant change passwords for shared network resources on Windows 9X servers. SynchroPass doesnt require administrative privileges to run. To run in Windows NT 4.0 installation of Service Pack 6 required. SynchroPass supports multiple languages. Currently installation package includes support for English and Russian. Support for additional languages may be added in future in form of add-in packages.